I love that word. It’s neat, evoking such as specific thing. I hate that word. There’s a guilty conscience for those books I haven’t read yet! 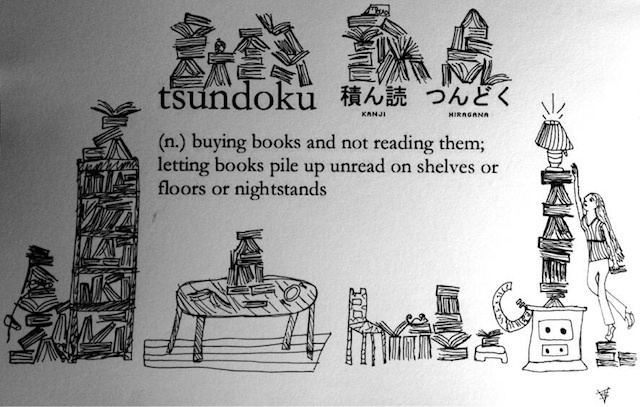 The illustration of tsundoku, above, looks to be from this reddit thread, drawn by the 12 year-old daughter of the writer ‘Wemedge’. My living room doesn’t have just one pile of books to read, it has several. How about yours? Here’s a couple of piles of books, stacked up for your viewing. I do read the books I buy. Eventually. 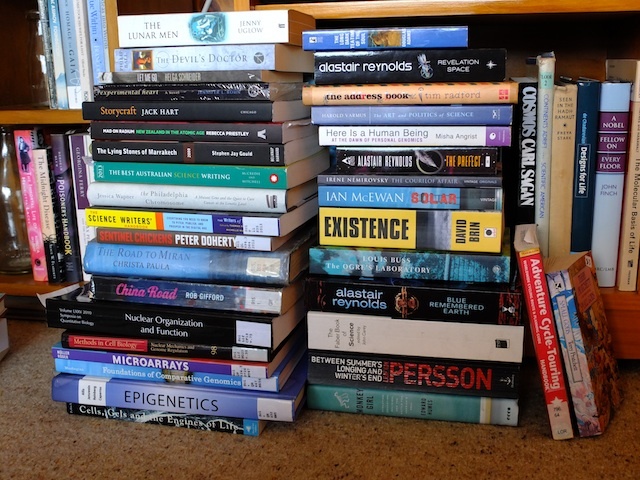 Two of them I am reviewing for sciblogs – the book with the green spine on the left-most pile (Best Australian Science Writing 2013) and the one below it (the Philadelphia Chromosome*). I’ll get there. I’ve previously reviewed Mad on Radium (two above Best Australian Science Writing 2013 in the same pile) and The Poisoner’s Handbook. It’s time for Christmas presents, which I figure is excuse enough to bring up that wonderful word tsundoku. Books are a great option; maybe this little post will encourage some readers to try science-oriented books as presents. Hopefully, the holiday break will offer time to read through some books… Is there a word for un-tsundoku-in-progress? I’ve read several of those in the photo and am part-way through others of them. Excuse the lower resolution of the photo (it’s hard to read the titles! ), but the file size of higher resolutions is a bit much for a blog post. * The title for the Philadelphia Chromosome has a lowercase ‘t’ in ‘the’; in the original title it’s in italics, ‘the Philadelphia Chromosome’. In good timing, John Dupuis has his latest additions to his Best Science Books 2013. Feel free to add your own suggestions. Some might be found in SciBooks, sciblogs’ book review blog.